Scientists at Tufts University have developed a wearable bioreactor that can promote partial regeneration of hindlimbs in adult African clawed frogs (Xenopus laevis) following amputation. 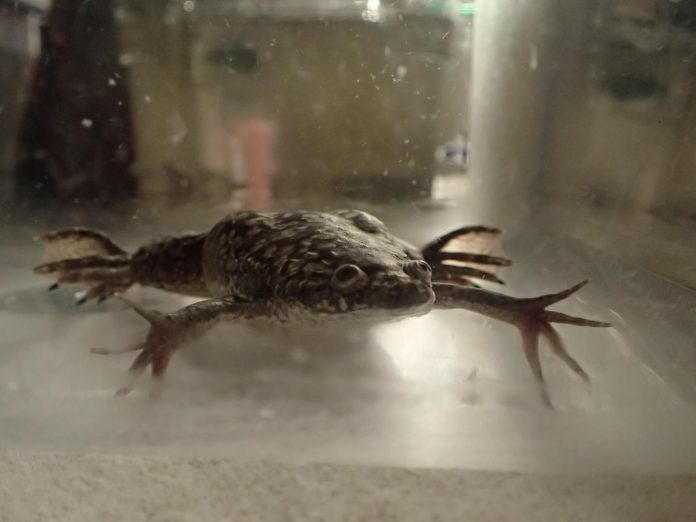 Tests showed that the hydrogel-filled device, which contains silk proteins and progesterone, induced the development of a rudimentary paddle-like limb that was more structured than the typical cartilaginous spike that regenerates in untreated frogs. Compared with untreated amputees, the bioreactor-treated animals were also more active, and capable of swimming more like normal frogs. The team 3D printed the bioreactor from silicon and filled it with a hydrogel containing hydrating silk proteins to promote healing and regeneration, and progesterone. They tested the bioreactor on groups of experimental, sham, and control adult Xenopus frogs. For the experimental and sham groups, the bioreactor (containing progesterone for the experimental group) was sutured onto the site of amputation immediately after limb amputation, but removed after 24 hours. Initial tests confirmed that the bioreactor released progesterone to the site of injury. Early in the regenerative process frogs in the experimental group also exhibited reduced immune infiltration, with evidence that bioreactor treatment induced scar-free wound healing. Treated animals also showed signs of regenerating nerves, “which are key markers of specialized tissue organization,” the authors write. Over the course of 9.5 months, the animals that had been treated using the progesterone bioreactor exhibited a greater degree of limb regeneration than the sham and control groups. The bioreactor-progesterone treatment prompted the formation of a paddle-like limb assembly that more closely resembled a fully formed limb than the characteristic spike formed by unaided regeneration. Macroscopic analysis indicated that the 24-hour treatment triggered long-term reorganization of both soft tissue and bone, with patterning that is “consistent with joint formation,” the team wrote. “The bioreactor device created a supportive environment for the wound where the tissue could grow as it did during embryogenesis,” said Dr. Levin. “A very brief application of bioreactor and its payload triggered months of tissue growth and patterning.” The treated animals were also far more active than the untreated animals, and the regenerated paddle-like limbs could be used in swimming and active behaviors that were similar to a native limb. The authors claim that their studies provide proof-of-principal that brief use of an integrated device for delivery of drugs represents a viable strategy for inducing and maintaining long-term regenerative responses. They acknowledge that what still isn’t known is what degree of micromanagement of the regenerative process will be needed besides providing the initial signal that flicks the regenerative switch. “Our data establish a platform to test ‘master regulator’ therapeutics, in which a very brief treatment ‘kick-starts’ a long program of growth and remodeling,” they conclude. “These findings reveal that the adult Xenopus limb is capable of considerable growth and morphogenesis and illustrates a roadmap for interventions that can be used to probe and improve the mechanisms of complex appendage regeneration in vertebrate models.” The authors suggest that a successful strategy may well hinge around a process of “guided self-assembly” that involves occasional external manipulation of endogenous morphogenic processes to keep growth on course.